A novel written by the man who voiced the Sniper in Team Fortress 2 is earning some pretty solid reviews from other TF2 characters on Amazon. You may not recognize the name John Patrick Lowrie but odds are that you're familiar with his work. He's a voice actor who's performed in games including No One Lives Forever, Half-Life 2, Left 4 Dead, F.E.A.R. 2, Halo Reach games and a whole lot more, plus Team Fortress 2, for which he supplies the voice of the Sniper. 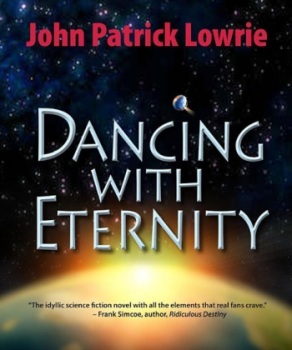 He's also an author of the new novel Dancing With Eternity, available now on Amazon, where it's attracting a crowd of rather unusual reviewers. "It was a good book, don't get me wrong," according to a four-star review posted by someone named Scout. "I don't normally read y'know, because I'm busy busting heads and capping points, but when I found out my friend Sniper wrote a book, I had to get it. I give it four stars. Would have been five if it had come with a hat." Another reviewer by the name of Heavy gave it a full five-star score, describing it as "is good." "Even if cannot read, you will like," he wrote. "Book is heavy so I throw at Spy. He will never ever walk again." Isn't that great? The Team Fortress 2 gang is a naturally competitive bunch, so I think it's fantastic to see that sort of camaraderie and support for one other away from the fields of battle. Editorial reviews for the book are coming in pretty strong too; Tracey Rock of Reader Views declared it a "fascinating sci-fi thriller" that "enthusiasts should put on their 'must-read' list." It's a nice sentiment, but it lacks the lively exuberance of, "Huddah huddah huh! Mmmph mph mmrph! mph mmmhh mphmm huddah! Mmmphya harrgh mrgha hrghgph! Murr mphuphuhuur huhuhu :)" I'll let you guess who wrote that one.